I am attracted to a type of art-making that finds its complexity through painstaking or bizarre methods of creation. I also think an artwork is one of the best ways to capture and catalogue a period in time. My video projects often require many people’s participation within a fabricated environment. Different from a typical film shoot, most of my characters, and scripts are developed through the process. The completed work should stand on its own, as well as provide a memorial to specific people, places and time. 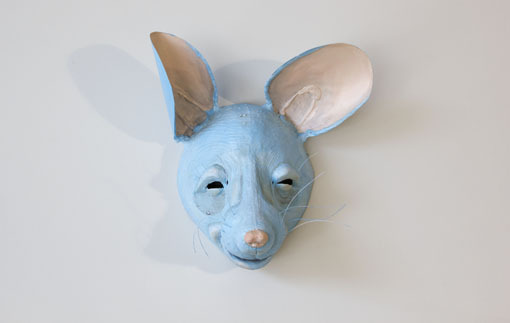 The RATSS cast and crew is made up entirely of Omaha-based artists and Bemis Center residents in late 2012. Patrick Biggs, a semi-professional mime, informed much of the gesticulations that occurred on-screen. Following a recent trip to Ecuador, I developed a fascination with the traditional parade masks sold inexpensively by many vendors. 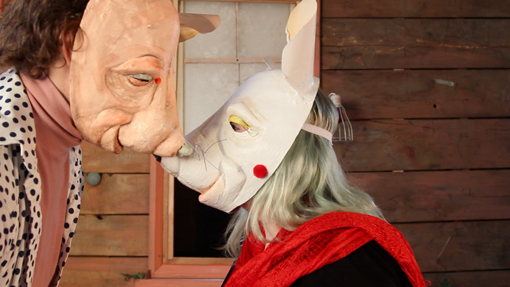 I spent the following year researching techniques to effectively reproduce my own version of these papier-mache masks in my studio. Working with many untrained actors, I have found their facial expressions to be the most distracting part of their performance. The frozen expression of the sculptural masks is my band-aide to this problem — RATSS is my first video that uses this strategy. I believe the video results from the sculptures; its function follows their form. Andrew Brehm is a sculptor and performance artist. Born in central Pennsylvania in 1983, he grew up competing as a long distance runner, later earning a scholarship to attend Kutztown University. While there, Andrew majored in Crafts, specialized in studio furniture, and completed his degree in 2006. In the years to follow, Andrew worked as a fabricator for the film industry and exhibited his works of furniture at craft and fine art galleries in the Philadelphia area. Many of his projects became performative as participants increasingly became necessary for the demonstration of these works. In 2011, Andrew earned his MFA in Sculpture + Extended Media from Virginia Commonwealth University on a full Graduate teaching scholarship . 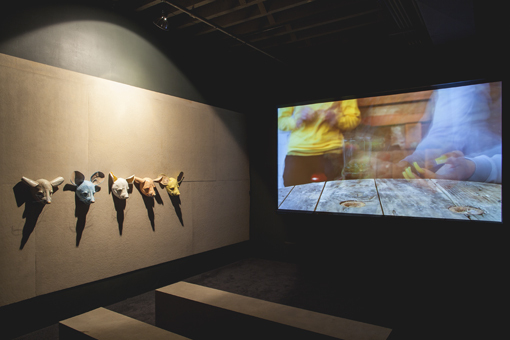 He continues to produce and exhibit performative works as well as sculptures, videos and installations. Andrew was a recent fellow at the Bemis Center.